PVC pipe end caps get new life as DIY planters. Everyone’s got that their weak spot. For Melissa, it’s succulents. 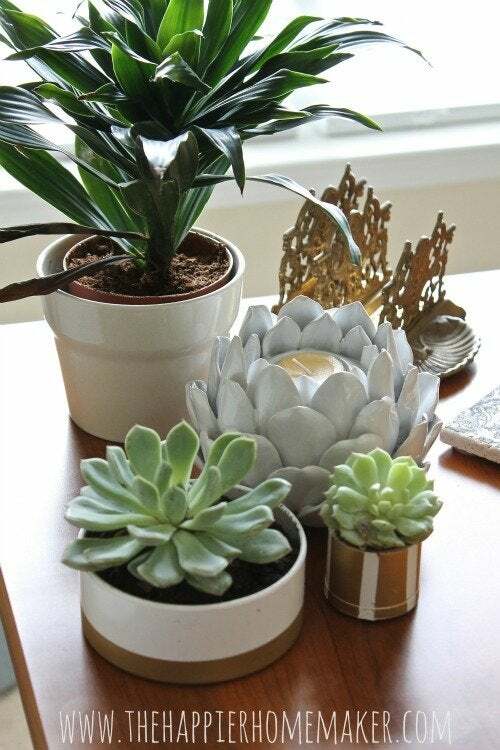 So when her gardening addiction found her running out of tiny containers for these low maintenance houseplants, she got creative. Inspiration struck in the unlikeliest of places—the plumbing aisle of the local hardware store. 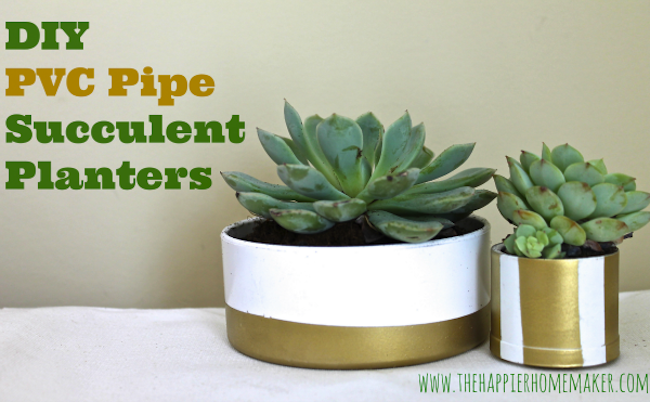 That’s where The Happier Homemaker blogger picked up all the materials she’d need to create these inventive PVC pipe planters. For about $5 and some paint she already had on hand, she elevated this humble plumbing staple to new heights. Take a look to see how she did it! I used painters tape to tape off the areas I wanted to stay white then I used the same Valspar Plastic Primer I used on my plastic playhouse makeover and gave them one quick coat. I let that dry for an hour before giving them two light coats of my favorite spray paint-Krylon Quick Shots in Gold Leaf. When the Gold Leaf was dry (I waited another hour) I carefully peeled off my tape-I love the way they turned out! Thanks for sharing, Melissa! To take a tour of Melissa’s house or see even more of her DIY projects, visit The Happier Homemaker.